Some truly gifted artisans are making spectacular spinning tools these days. I have a stable of more than I’d like to admit, and yet I covet more. So why would I want to make a drop spindle myself? Three reasons: I break things, I lose things, and aspinneration. “Aspinneration” is the word for making new spinners, and it usually involves thrusting a spinning tool and some fiber into their hands. If you want to let them continue learning on their own, you need to have a spindle that you can give away. 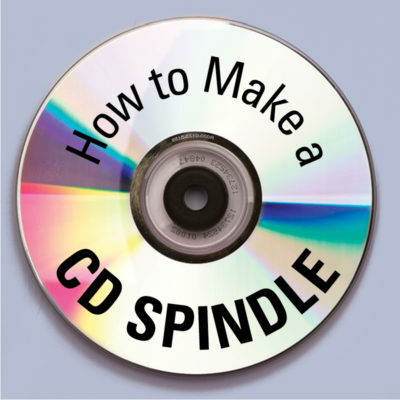 You can make an inexpensive DIY drop spindle with a CD whorl. 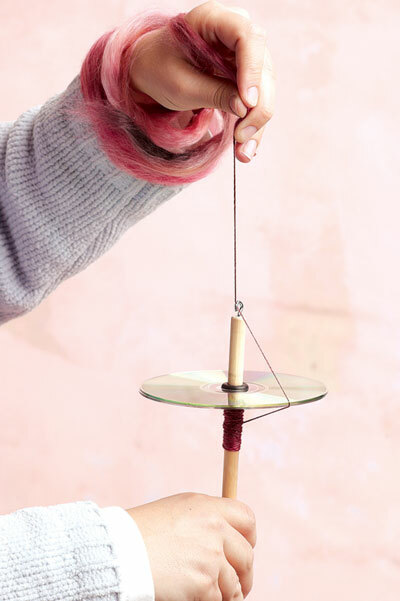 You can also learn how to make a drop spindle using a toy wheel. Cons of a CD spindle: It can be wobbly; finding CDs isn’t as easy as it used to be; it can be difficult to set the hook in the end of the shaft. You can make a simple spindle using recycled compact disks, a grommet, a small eye hook, and a dowel. Sand the ends of the dowel so they are smooth and have no burrs. On one end of the dowel rod, find the center and mark it with a pencil. Wearing safety goggles, secure the dowel in a vise clamp and drill a starter hole for the eye hook in the center. Screw in the eye hook, then open it with the needle-nose pliers so that it creates a hook. With the marker, draw a clockwise arrow on the top CD. Place the two CDs together and insert the grommet through the center hole of the CDs so that the CDs rest inside the groove. Insert the dowel through the grommet and position the CDs about 2 inches down from the hook for a top whorl spindle or 10 inches down for a bottom whorl spindle. Test your spindle for smooth rotation and balance by placing the end with the hook on the table and giving the top of the shaft a hearty spin. Keep it upright by loosely enclosing the top of the shaft with a circle of your fingers and thumb; allow it to spin freely. You’ll need a bit of practice to get the hang of turning the spindle efficiently. If it turns smoothly like a top, you’re in business. A little wobble is fine, but if your spindle wobbles a lot and slows down quickly, make another spindle. You’ll enjoy spinning more with a spindle that works well. 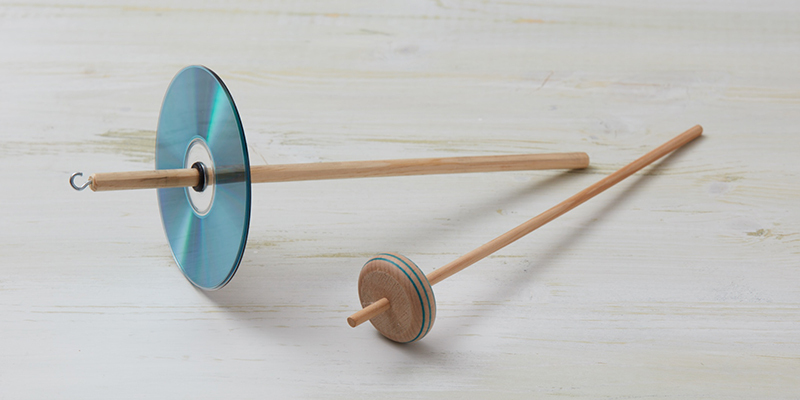 A DIY drop spindle made from a CD is an easy, portable, and inexpensive way to get a new spinner started. Find more excerpts from Spin It! in Spin Off Presents: How to Spin It. 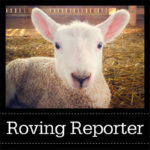 Discover something new in our shop!